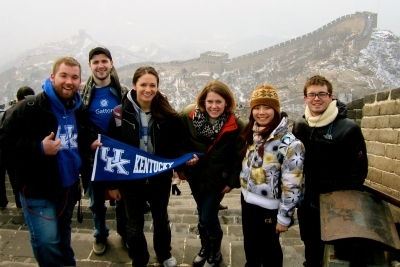 (Dec. 12, 2013) — The University of Kentucky has more students participating in Education Abroad (EA) programs than any other higher education institution in Kentucky, according to recently released data by the Institute of International Education. The 2013 Open Doors Report revealed that UK sent 845 students abroad in the 2011-12 academic year. The report also showed that UK enrolls more international students (nearly 1,900 in 2011-12) than any other institution in the state, a lead the university has maintained for many years. According to Anthony Ogden, director of Education Abroad & Exchanges, the growth and sustainability of international education at UK is due in part to the curriculum integration, which aligns EA programming with the academic strengths of the university. 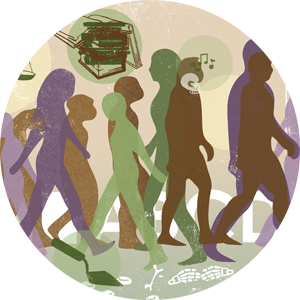 Last year the number of students enrolled in EA programs rose by an astonishing 39 percent. This year EA has retained that growth, proving that their work is creating sustainable change on UK’s campus. The growth is also due in part to initiatives such as the Major Advising Pages, which assists students with selecting programs that most closely align with their majors. These abroad programs integrate into the students' degree programs, and do not delay the time to degree completion. EA has also intensified the diversity of its portfolio through five experience types – study abroad, research abroad, intern abroad, teach abroad, and service learning abroad. The growth in the numbers of students coming and going also reflects how the UK International Center is serving the UK community by facilitating the interaction of global students and scholars, according to Carvalho. “We not only create diverse opportunities for global experiences, but also promote the involvement of UK faculty and students in the international community of scholars to investigate and solve global problems,” Carvalho said. Ogden believes UK’s success is contingent upon all of Kentucky’s institutions of higher education. “If all families and students, whether at UK or University of Louisville, hear the same message, that international education is important, that international knowledge and expertise is important, then we will be successful,” said Ogden. For more information about international education at UK visit www.uky.edu/international. For more information about the Institute of International Education and the Open Doors Report, visit www.iie.org. Video by UK Public Relations & Marketing.